The swarm computing is the field of the computer science that is designed for the effective study of the computational methods. It is behavioral modeling approach that focuses on the study of the swarm in the different domains which includes the image and data analysis .It is primarily used to find optimal solutions and enhance the function optimization. The modeling method associated with the swarm computing is applied in various technologies such as medical informatics, bioinformatics and artificial intelligence. It primarily deals with the forecasting of the problems by taking collective decisions in order to provide all necessary information. Currently the global swarm computing market is observing vibrant growth on the account of increasing trend of the big data analytics coupled with the rising computer simulation methods. This is expected to drive the growth of the overall swarm computing market during the forecast period. Additionally, the increasing deployment of the drones and automated robots for various industrials and commercial uses is expected to be other reason for the growth of the global swarm computing market during the forecast period. The growing technological development coupled with the advent of the big data analytics in order to solve the complex problems is anticipated to be the major growth driver for the overall swarm computing market during the forecast period. 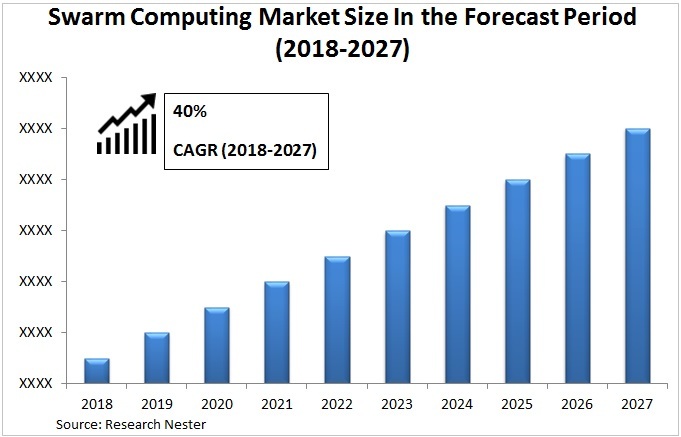 The wide application of the swarm computing for industrial purpose is anticipated to be major driver for the overall swarm computing market during the forecast period. The increasing adoption of the swarm computing for the surveillance is also anticipated to be drive the swarm computing market. The integration cost associated with the robots including installation and up gradation is expected to restrain the growth of swarm computing market during the forecast period. On the basis of regional analysis, global swarm computing market is segmented into five major regions including North America, Europe, Asia Pacific, Latin America and Middle East & Africa region. Asia-Pacific is anticipated to be the leading region for the global swarm computing market. The growing adoption of the robots in the region is anticipated to be major reason for the growth of the swarm computing market. For instance, according to International Federation of Robotics, China accounted 36% market share of the total robots supply in 2017. North America is anticipated to showcase substantial growth during the forecast period. The growing technological development in the region leads to increasing adoption of the technology which includes artificial intelligence. This is anticipated to be major reason for the growth of the overall swarm computing market.